The town of Illescas lies midway between Madrid and Toledo. It’s home to El Bohio, a Michelin star establishment hiding behind an unassuming one story facade in a semi-industrial neighborhood. A 45 minute cab ride from Madrid, the fare one-way could easily have fed us both very well at any tapas bar on Calle Cava Baja. Inside, it’s spare and rustic. Exposed wooden beams jut out from the ceiling and heavy traditional furniture anchor themselves on the stone tiles. As we are seated, the waiter brings out an extra chair, a miniature one, for my bag! We initially opt for ala carte but, after much second-guessing, change our minds and go for the full blown Degustacion menu. After all the effort it took to get here, why skimp now. Might as well have the works. 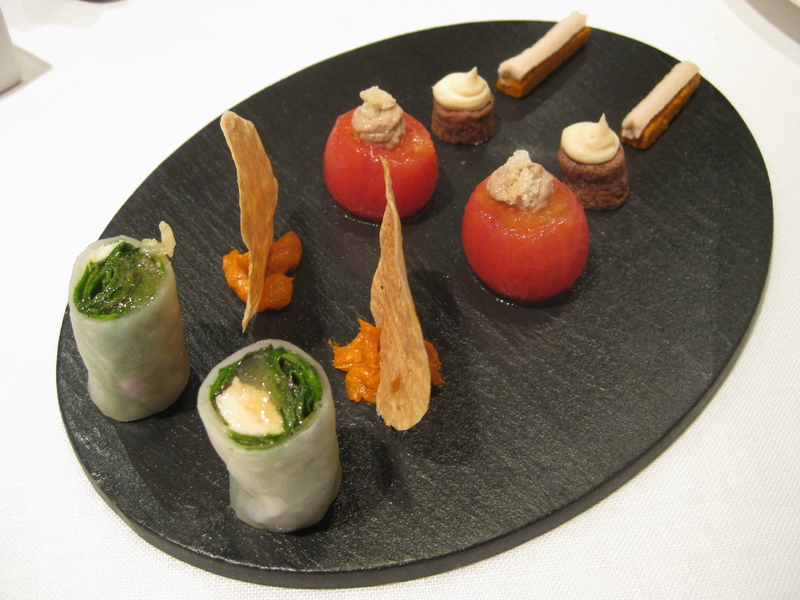 Amuse bouche (front to back): ensalada de pollo, chicken wrapped in lettuce then rolled in rice paper; sobresada, a spreadable chorizo, with a thin translucent piece of fried pork rind masquerading as a tuile; mojete de la mancha, tuna stuffed in a cherry tomato and topped with crispy roe; black olive and parmesan bread topped with anchovy paste; a long rectangular galeta made with tomato and anchovies. Chorizo in puff pastry accompanied by a glass of sangria. Queso, Lima, Trufa y Curry. No, someone did not pour concrete mix on my plate. That’s truffle ‘sand’ liberally coating shards of meringue that melt quickly on the tongue. The first thing that hits me is the temperature. The dust is cold; in fact, it’s freezing, but it doesn’t taste much of truffles. It’s dry and grainy in contrast to the unctuous and creamy La Mancha cheese. Pulpo con Caldo Especiado de Membrillo. 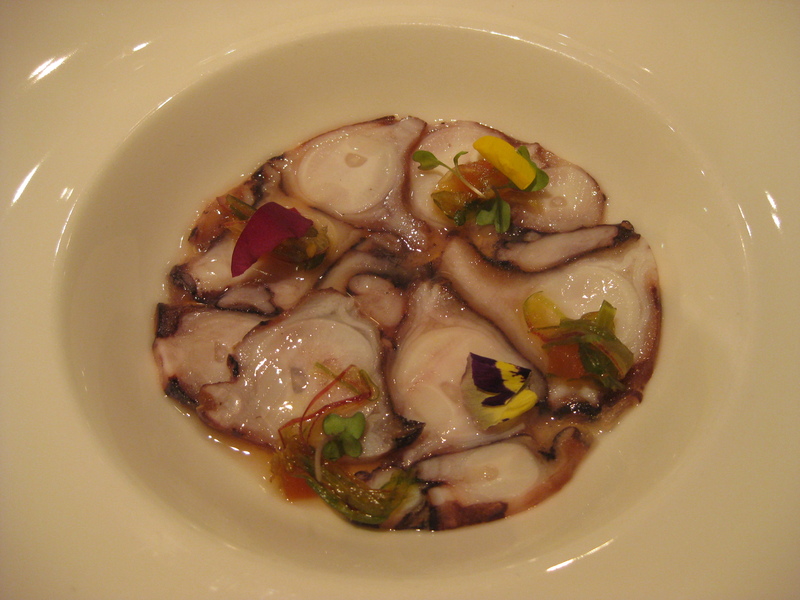 Slices of octopus floating in a quince flavored broth. A bit like a ceviche. Espardenas, Pan de la Sopa de Ajo y Yema Batida. 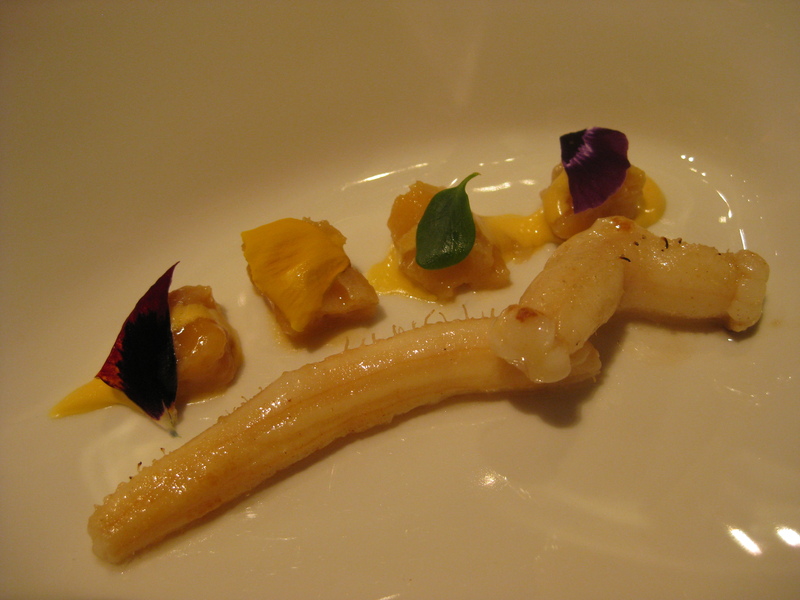 Espardenas is sea cucumber, but these are a far cry from the ones I know — those fat slimy slugs drowning in liquid cornstarch served in Chinese banquets. These long narrow tubes hail from the Costa Brava and are delicate, crunchy and juicy at the same time. A real pleasure to eat. 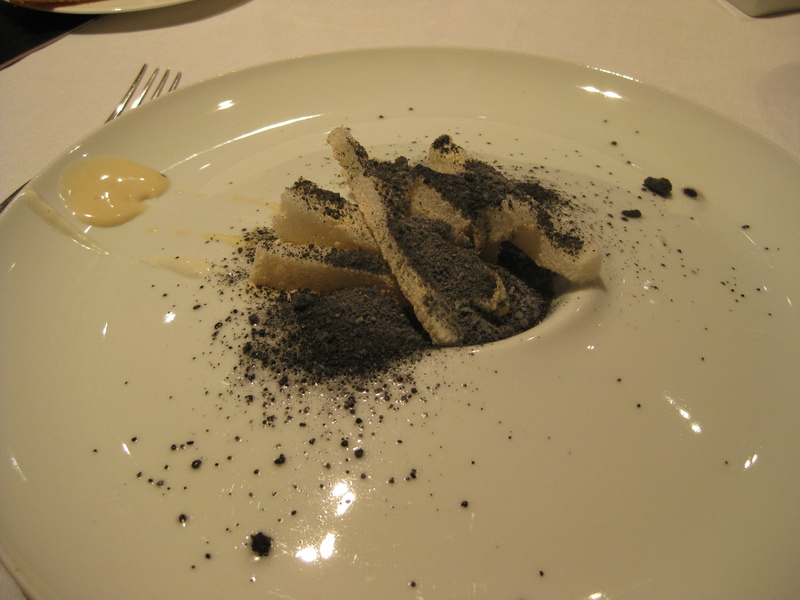 Potaje con Bunuelo de Bacalao. 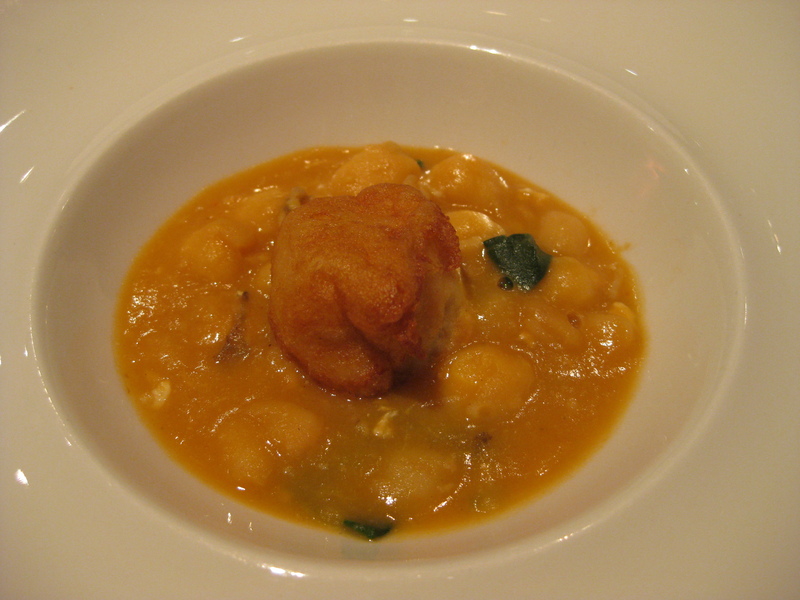 A codfish fritter — light, milky white and almost hollow on the inside — sits on a creamy soup of chickpeas. Apparently a staple during Holy week. Merluza con Salsa Verde de Ternera. 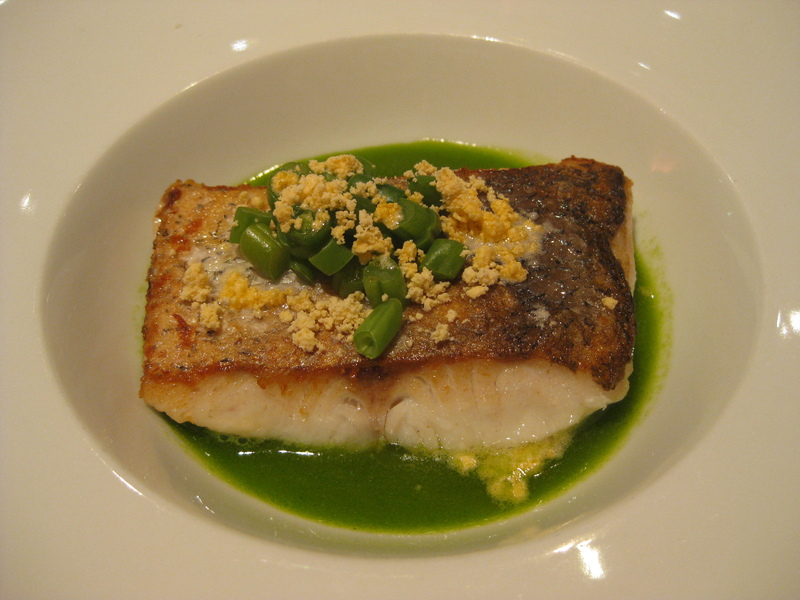 Hake with a green sauce made of veal stock. Mar y montana, inspired by the sea and mountain is what I’m told. Ropa Vieja y el Caldo del Cocido. Not your typical soupy ropa vieja. 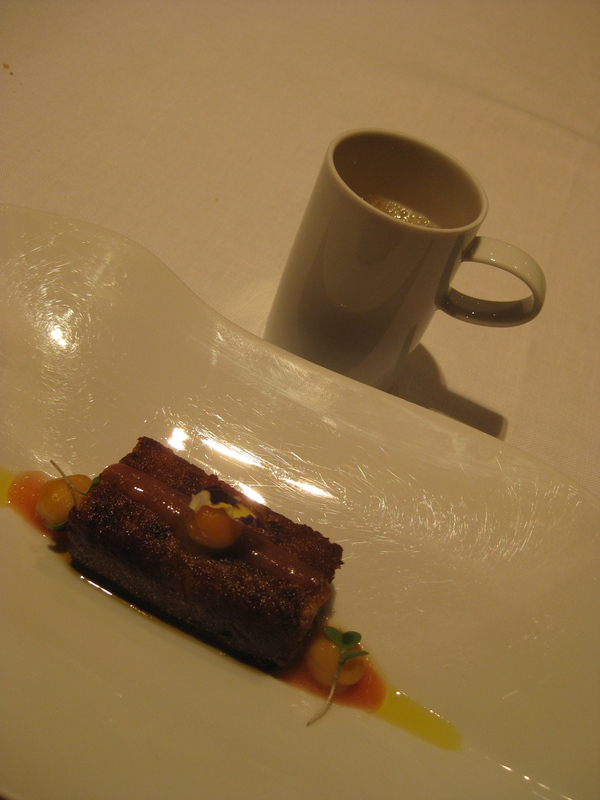 This log of flaked pork meat culled from various parts of the pig sits on top of tomato pulp while the hot broth is served separately on the side. Ciervo Asado con Membrillo y Foie. Venison, quince and foie gras. Majado de Pina, Hierbas y Helado de Miel. 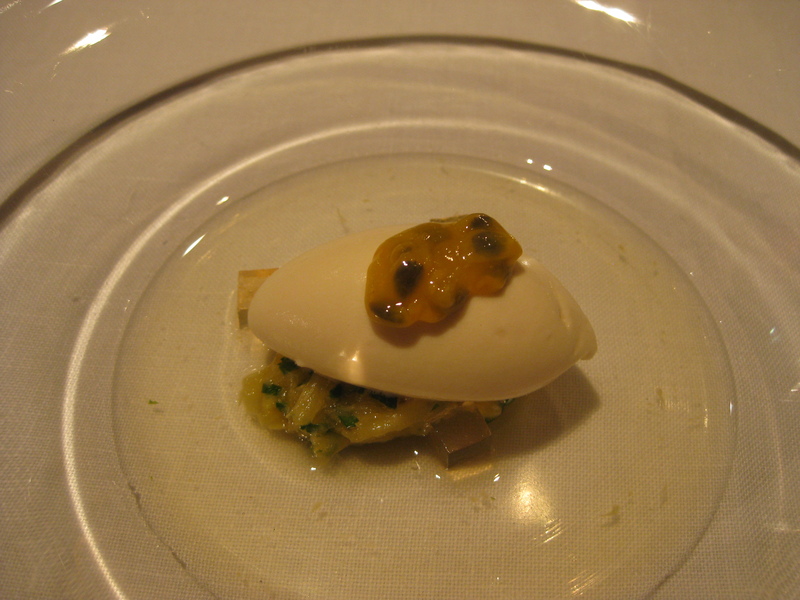 Honey ice cream on top of bits of pineapple and herbs cooked in syrup. Flan de Caramelo. This Christmas ornament happens to be a very creative take on the classic creme brulee. 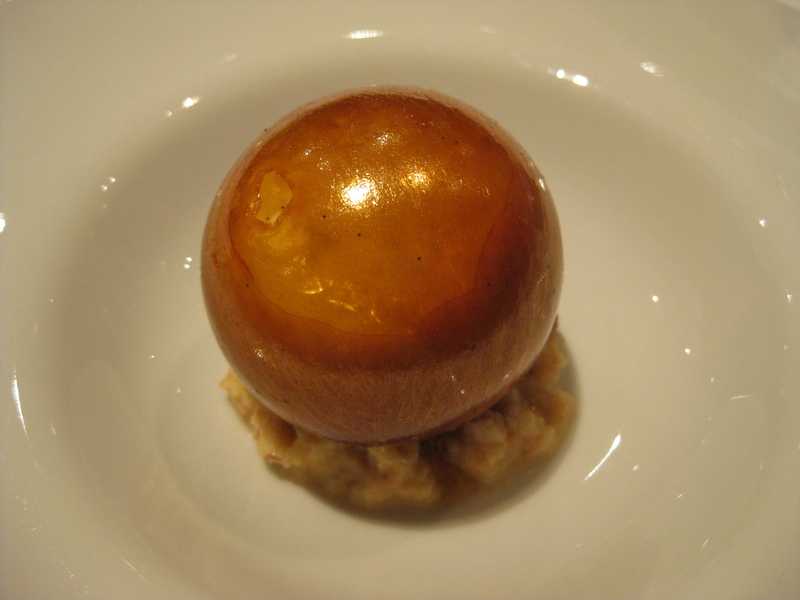 A hollow ball of caramelized sugar (not sweet but slightly bitter), it is thicker at the base than at the top. Such a shame to have to crack it open to get to the flan inside. All in all, no regrets for having ventured so far. El Bohio is worth it. ~ by Jaded Fork on March 5, 2011. This looks like a wonderful meal! 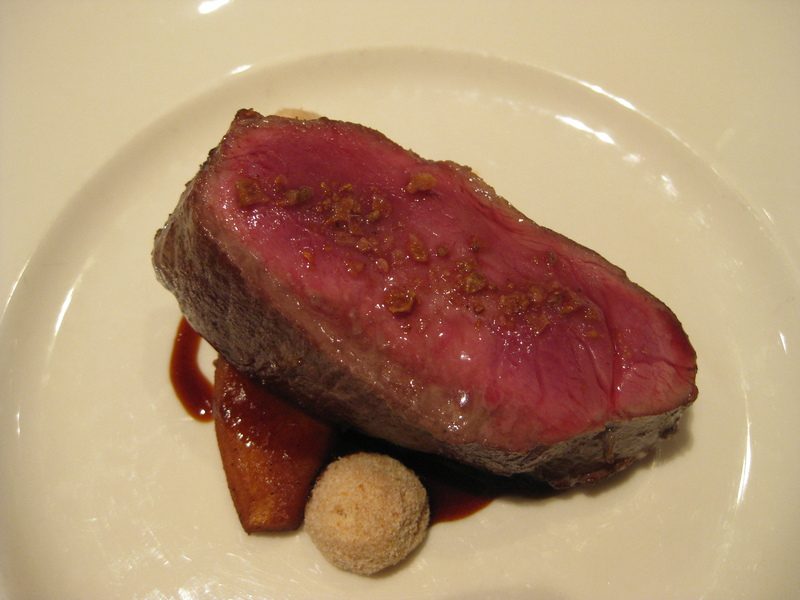 Would love to try that venison & foie gras dish! It was really good. 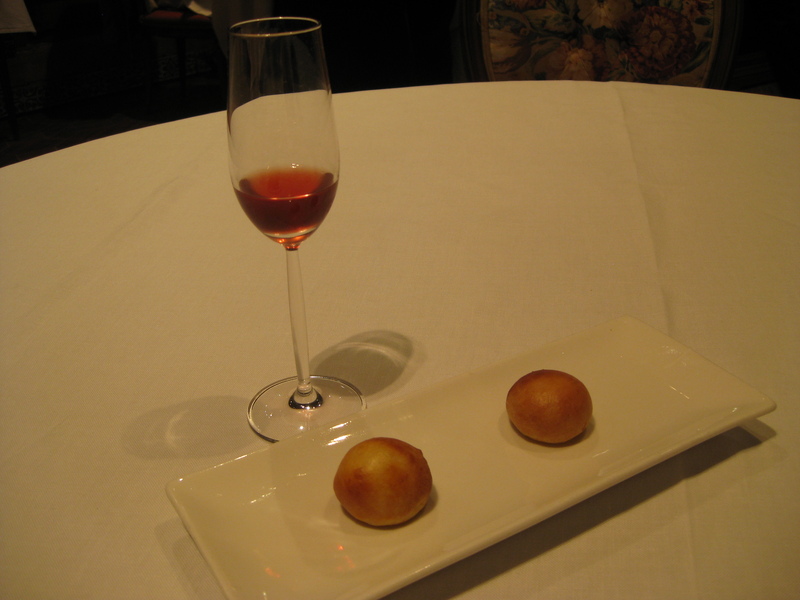 I’m glad we changed our minds and went with the tasting menu. 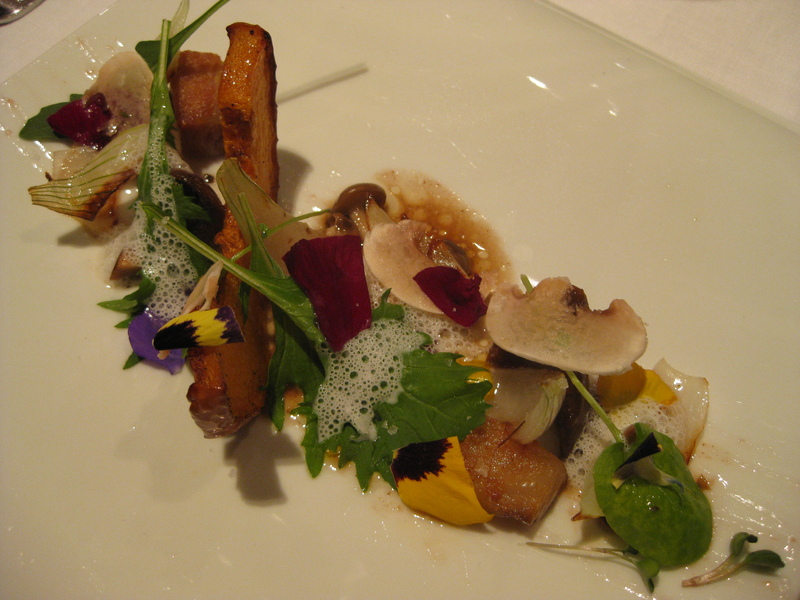 Just wondering, what did they charge you for the degustation in euros? We are heading there in September.